It’s now some time since we last updated the story of the Daer Project. 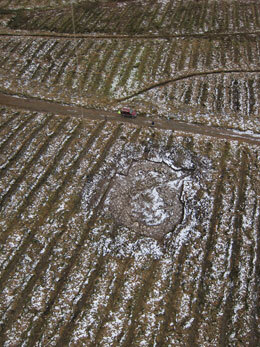 Site No 111 has now been photographed by kite. The photos were taken by John and Rosie Wells and Jim Knowles (their website), the leading experts for such work in Scotland. They show the penannular ring enclosure in its entirety and also the relationships with a new road and deep drains, which could easily have cut through the previously invisible site. We still don’t understand its purpose or for that matter the site just up slope from it (No 110) which although somewhat different in character share the similarity of having no finds to help with interpretation. Each site does have post holes and we have good charcoal from both, so dating should not be a problem. We believe we can rule out habitation and funerary purposes, and the strong belief is that they are something to do with mortuary practices. 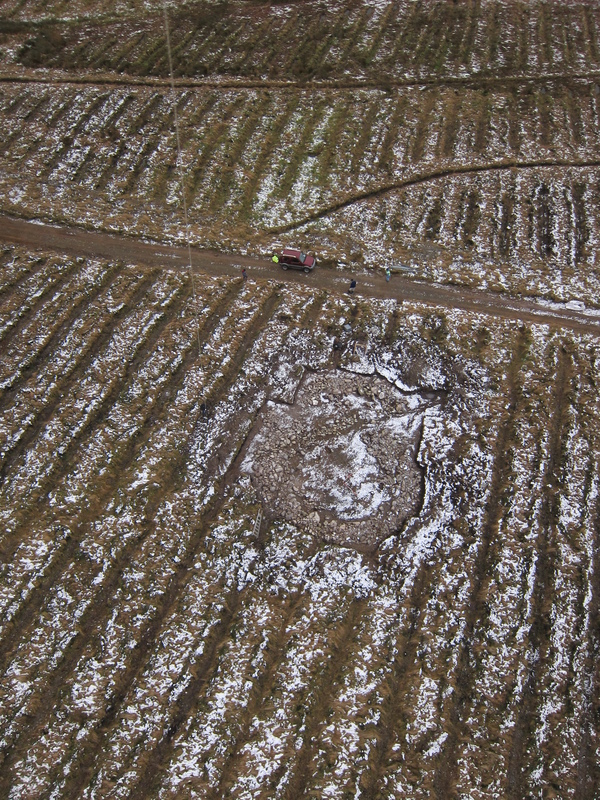 We are currently pursuing grant funding from the nearby Wind farm grants scheme in the hope that we can complete the post excavation studies of all of the work up there. We are engaged in a comprehensive test pitting project on one area of the hill, and results are fantastic, out of about 150 pits so far, we have three further Mesolithic knapping sites, one of which looks like proving the haematite being found is Mesolithic in date. 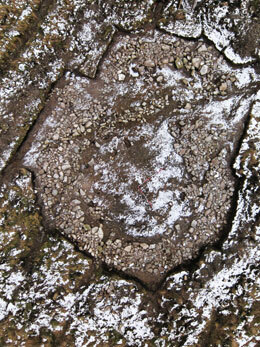 We’ve also discovered another cairn– more likely a stone setting of about 2.5m in diameter. Depending on any further discoveries by test pitting, the work is starting to draw to a close – but keep an eye on the web as reports on individual excavations will be appearing on a regular basis.